A bicycle lane stretching from Istanbul’s Kanlıca to Paşabahçe districts. Turkey plans to build a 3,000-kilometer bike lane network by 2023. The ruling Justice and Development Party (AK Party) is striving to keep its lead in the municipal elections as it did in the national elections for more than a decade. Highlighting the party's election manifesto this time around is "cities respecting the environment." Economic and population growth pose a major challenge, but the government says it is committed to pursue what it calls its "2023 goals," marked to usher in the centennial of the Republic of Turkey. Within four years, a string of regulations and makeovers are expected to make cities more livable. They cover everything from bicycle lanes to more waste and water treatment plants to architecture. New zoning plans are key to better protect cities' environment and urban texture. "Strategy plans," as the government call them, focus on the preservation of lands for agriculture and tourism, while adhering to industrialization "sensitive to environment." The urban transformation project, an ambitious nationwide plan to demolish old, crumbling buildings and replace them with new, preferably shorter ones [with President Recep Tayyip Erdoğan calling for "horizontal architecture"] also tops the agenda of the government. Transformation primarily aims to minimize damage from any earthquake in this earthquake-prone country, and by 2023, 1.5 million buildings will have been transformed, while Turkey foresees transforming some 6.7 million buildings in the next two decades. The government also plans to promote "local architecture" in rural areas where urban architecture styles started to permeate. Bicycle lanes are also on the agenda to reduce emissions from motor vehicles and promote a healthier lifestyle. A network of bicycle and walking lanes will be expanded with new additions by 2023 and will be integrated with Europe's EuroVelo, a network of 15 long distance cycle routes connecting the continent. 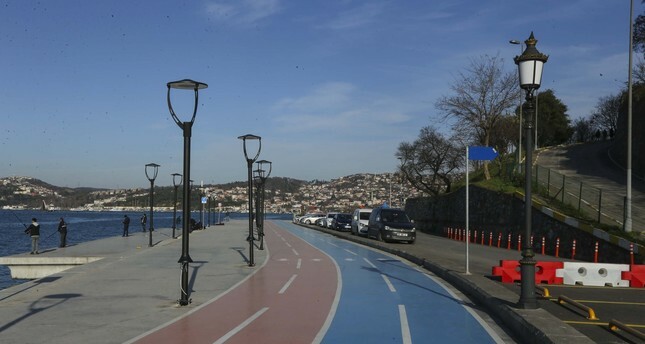 The lanes will take cyclists from Edirne in the northwestern-most Turkey to inner parts of the country, while a separate route will connect Aegean shores with Antalya in the Mediterranean region. Istanbul will be connected with the capital Ankara and Anatolian heartland with new lanes. Overall, Turkey plans to build a 3,000-kilometer network of bicycle lanes and 3,000 kilometers of walking lanes. The plans also include construction of 60,000 square meters of noise barriers in settlements located near busy highways to cut down noise pollution. Waste and wastewater treatment is another angle in plans for environment-friendly cities. The government would subsidize municipalities' solid waste treatment facilities. By the end of 2019, wastewater treatment facilities will cover 89 percent of the population in cities, and this rate will reach 100 percent in 2023. In recent years, Turkey has started to prioritize waste management, over concerns of rising environmental damage, with municipalities responsible for garbage collection and upgrading their waste management systems. The country also managed to recycle more than half of the plastic bottles in the market in 2017. Under a new draft bill, every business or public institution will be required to receive a zero waste certificate that will evaluate how they have complied with the new policies. The bill also makes it mandatory for municipalities to set up facilities for collection of waste separated at its source.